At least in some respects all children are Neanderthals. It is the grand challenge of parenthood to civilize these sometimes savage little creatures by teaching them language, manners and safety. Some of the most difficult choices parents must make come when we try to encourage children to be strong, brave, independent and adventuresome when it comes to accomplishing goals in school, sports and chores while protecting them from mistakes that could be hurtful or even devastating. 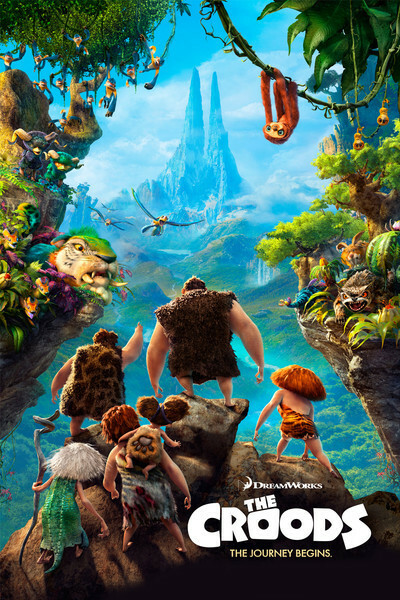 That's the idea behind "The Croods," the sweet, animated film about a prehistoric cave family. Familiar family dynamics are amusingly exaggerated in the Paleolithic setting, where the most basic necessities require everyone's full-time attention. The heavy-boned characters designed by the brilliantly witty Carter Goodrich ("Despicable Me," "Hotel Transylvania") may argue, but they demonstrate the strength of their bond on their hunting/gathering expeditions. When this family goes out to get breakfast, they really go out to get breakfast. In a joyously choreographed race to get food, parents Grug (Nicolas Cage) and Ugga (Catherine Keener), Ugga's mother, Gran (Cloris Leachman), and their three children work seamlessly together somewhere between extreme dodgeball, an obstacle course and a rugby game. Even the happily feral baby joins in for a crucial maneuver. Other than that, they stay inside a cold, dark, cave. None of the other families of their community have survived, and Grug is terrified of anything that he cannot control. So he tells his family that "curiosity is bad and anything that is new is bad." Keeping everyone alive is his full-time job. "Never not be afraid," he warns them. "Fear keeps us alive." "I will never do anything new or different," promises son Thunk (Clark Duke). But rebellious teenagers go back as far as protective fathers, and Eep (Emma Stone) wants to explore the world outside the cave. What Grug sees as safe and under control, Eep sees as boring and old-fashioned. That bigger world includes a stranger, a guy named Guy (Ryan Reynolds). He has a lot of new ideas like tools, shoes, a "belt" (a monkey with a theatrical flair for flourish) and "baby suns" — fire. Eep wants to learn more. And soon Grug has to make changes because the tectonic plates start to shift beneath him. Staying the same is no longer safe. The family must leave to find a new place to live. Grug has to learn that sometimes new is not bad. And Eep has to learn the value of what she already has. Kids will enjoy outsmarting the Neanderthals, whose experience of the world is so limited that they think fire can be extinguished by dry grass. They will get a kick out of Guy as a proto-MacGyver who shows his traveling companions how to use rocks, vines, leaves — and strategy — to trap food and protect themselves from predators. As Grug and his family leave their rocky home, they find new environments that are increasingly dazzling, with spectacularly imagined vistas and gorgeous vegetation. Those images nicely parallel the opening minds and spirits of Grug and his family. Despite a few too many mother-in-law jokes, "The Croods" nicely makes it clear that even before they had fire, families understood how important it was to cherish and protect each other. Eep reminds us that what may feel like teenage obstinacy and foolhardiness may just be the next step in our evolution.